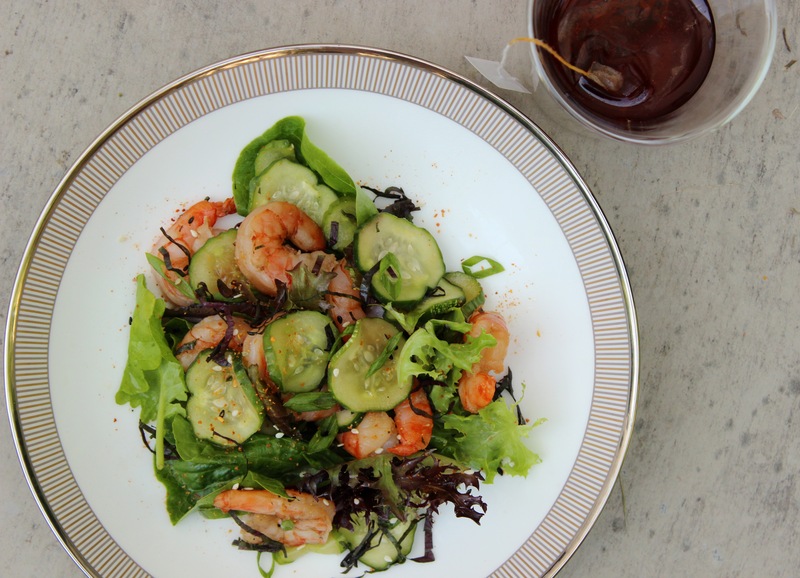 This lovely salad of roasted shrimp and pickled cucumbers tossed with a quintessential Japanese soy-mirin-rice wine vinegar dressing is lovely with or without the shiso. So please don’t skip it if you can’t get your hands on some. But if you can, I promise you that this citrusy, anise flavored herb will add so much depth to the flavor of the salad. It sort of surprised me how much better it made the dish. When I served this salad, I served it as a main course lunch and it was plenty filling. But I also think it would be nice to pair it with a collection of cold plates on a hot summer evening. I’m thinking cold sesame noodles, tuna tartare on crispy wontons, and green tea ice cream to finish. The way I look at it, if you can’t make the trip to Japan, you can always send your senses there instead. Pickle the cucumbers: In a small bowl, combine the salt and sugar. Place the cucumbers in a medium bowl and sprinkle over the salt and sugar and toss to combine and coat. Pour over the vinegar and toss to combine. Let sit at room temperature for 45 minutes to 1 hour, depending on how thinly you’ve sliced the cucumbers and how pickled you prefer them. Roast the shrimp: Meanwhile, preheat the oven to 450°F. Pat the shrimp dry with a paper towel and place on a rimmed baking sheet. Sprinkle with the ginger and salt to taste and toss to combine and coat. Spray the shrimp with cooking oil. Roast for 5 minutes, until just cooked through. 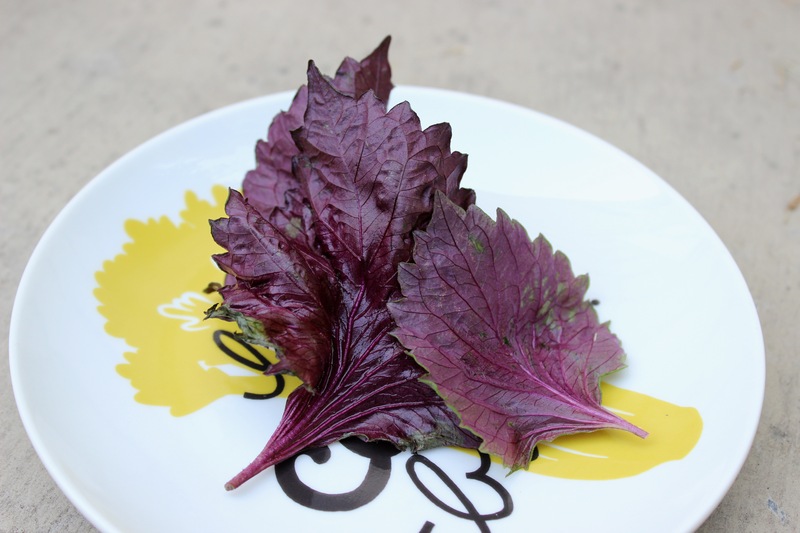 Remove from the oven, place in a medium bowl and toss with the 1 tablespoon sliced shiso leaf. Make the dressing: In a jar, combine all the dressing ingredients and shake well to combine. Shake well again just before pouring over the salad and shrimp. Assemble the salad: Place the cucumbers in a colander in the sink, run water over them to rinse off the excess salt and sugar. Pour 1 tablespoon of the dressing over the shrimp. In a large bowl, combine the rinsed and dried cucumber with the mixed greens, shiso, and scallion. Pour the remaining 3 tablespoons of the dressing over the salad and toss to combine. Sprinkle with sesame seeds and togarashi, if you like and serve with the roasted shrimp. *These are the small cucumbers that are great for pickling. This entry was posted in lunch, main, salad and tagged cucumber, Japanese, pickle, red shiso, rice wine vinegar, salad, sesame dressing, shiso, shrimp. Bookmark the permalink.